After finishing Unhinged I wasn’t particularly excited to start Ensnared. I gave Splintered 5 Stars but the sequel left me wanting. I didn’t like how Alyssa treated both Jeb and Morpheus and I thought the story lost some of its magic because it wasn’t set in Wonderland. 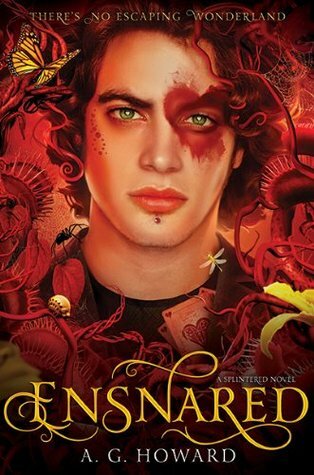 Luckily, Ensnared was able to tap in the series Splintered beginnings and I enjoyed the ending to this trilogy. Ensnared begins where Unhinged left off. Alyssa is on the memory train with her father. She is trying to get to AnyElsewhere to rescue Morpheus and Jeb and to face down Queen Red. I make no secret about the fact that Alyssa got on my nerves in Unhinged. I felt like she was leading on Morpheus and Jeb and that she treated Morpheus really poorly. In this installment Alyssa continues to lead them both on but I think she does a better job of justifying it. Alyssa also really starts taking responsibility and I found myself liking her a lot more. Jeb is the character, in my opinion, that changed the most in this installment. His time in AnyElsewhere really alters him and I liked the stronger, deeper, Jeb that emerged. Morpheus also changes, although in much more subtle ways. He is still my favorite character in this entire series and I just loved all of his trickstery ways! Overall, Ensnared was a solid conclusion to this trilogy. I enjoyed the ending and the journey to get to the reader there. Although this is the last book in the series AG Howard is releasing another book in December of 2015, called Untamed, which will delve more in to the epilogue and the past. I can’t wait to get my hands on that one! I love the covers to this series. Sadly, I have yet to start it. I'll remedy that soon. Great review! I am a little ashamed to admit that I haven't started this series yet. I even have the first book in the series sitting on my bookshelf, judging me. I'm glad you liked it so much! I am glad that this one was able to pick things up a bit again, which is much deserved for sticking with the books. I haven't began this series but I would very much like to at some point.